First prepare the spaghetti according to the package instructions, then drain and set aside. Place the oil in a large pot over medium heat. Sauté the garlic until golden-brown. Add the spaghetti and stir well, to evenly incorporate the oil and garlic throughout the pasta. Afterward, pour the marinara sauce over the pasta and continue to mix. Divide the pasta into four servings and garnish with a generous amount of Parmesan cheese (or as desired.) Serve immediately. If you're a big fan of garlic, try using a garlic marinara sauce. It's worth making a "double" batch of this recipe to have extra for lunch the next day. Ahh… pasta! There are so many varieties and sabores to choose from. Who doesn't love a steaming helping of this dish? 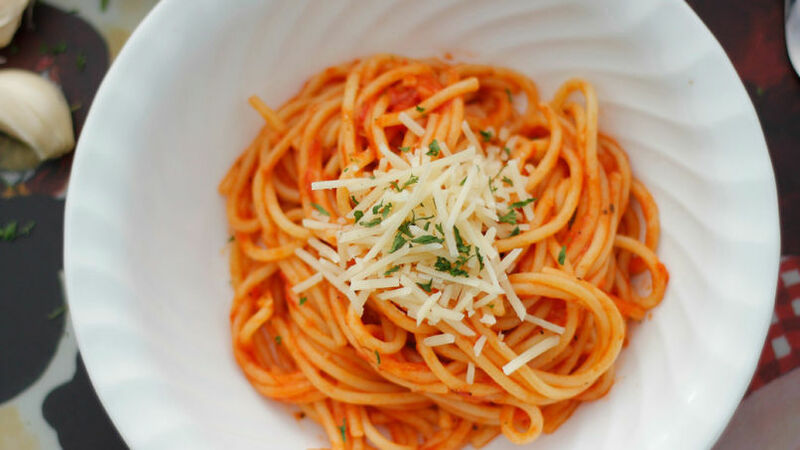 In my house, spaghetti is the crowd favorite and one of the meals I make regularly for the kids. I always have the ingredients on hand, so that when my children come home hungry from school or if I just need something quick for dinner this recipe is always within reach! With just five ingredients, this delicioso dish can serve four and is budget-friendly. Besides, your kitchen will smell divino while you’re sautéing the garlic. How do you prepare spaghetti in your own home?